There are two parts to this – depending on how much of a pro you are in the kitchen. 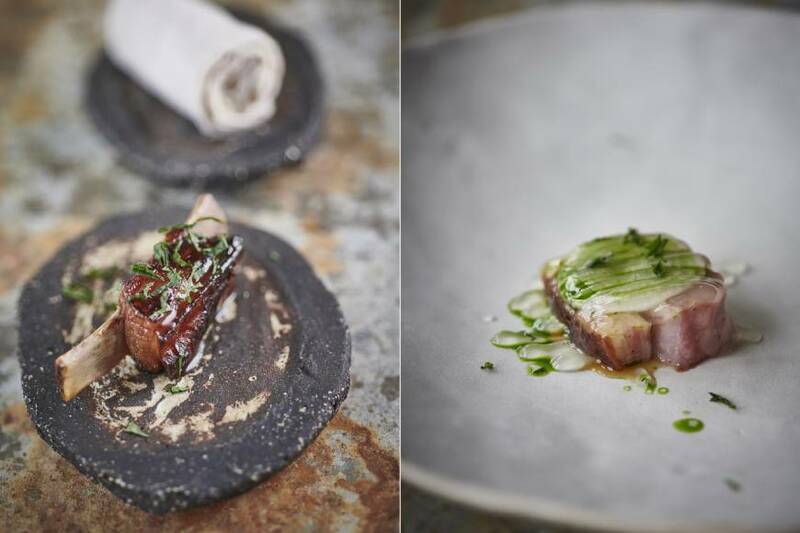 Gareth Ward runs Ynyshir Restaurant and Rooms in Powys, named Best Restaurant in Wales at the National Restaurant Awards 2018 – so it’s fair to say, he knows his way around cooking Welsh lamb. In this recipe, the lamb is served in two parts: Rib then loin. For the lamb rib portion, you’ll need a water bath. But if you haven’t got the kit, skip the rib and head straight for the lamb loin portion of the recipe, using the glaze from part one. Ask your butcher for two lamb bellies with the rib bones still attached. 1. Lightly season both sides of the lamb bellies. 2. Vacuum tightly in a bag and cook at 68°C in a water bath for 24 hours or until bones can be removed easily. Take out of bath and press in the fridge for 24 hours. 3. Portion the belly into individual ribs and trim to expose the bone on one side so it can be picked up and eaten. Reduce all the ingredients together slowly in a pan until thick. 1. Score the fat on the lamb and season with salt. In a pan, cook slowly on the fat side for about five minutes on a medium heat. Flip onto the meat side and add a knob of butter and leave to rest until cooked to medium. 2. Put 250ml of mint kombucha into a pan. Add 3g of agar and bring to the boil. Leave to set in the fridge. Blend once set hard with the remaining mint kombucha and pass. 3. To finish the dish, take four slices of lamb and brush with the glaze from the ribs. Very thinly slice the onion (with a mandolin) over the top of the lamb. Spoon over the kombucha agar mixture and chop over some fresh mint. Recipe courtesy of Gareth Ward, chef owner at Ynyshir.